heart of downtown South Haven that sleeps up to four people. 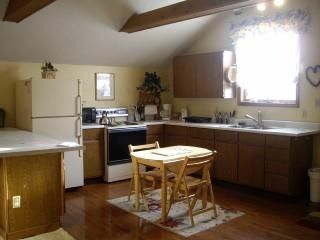 This unit includes a fully equipped kitchen with large and small appliances. The bedroom has a queen-sized bed, and a twin daybed with additional twin pull out. Sheets and bath towels are provided. The bathroom has a shower only. right downtown, you have instant access to many restaurants, a movie theater, antique stores, bakery, and specialty retail stores. beaches, several community parks, the harbor, and groceries. Wifi and private parking are available. Great access to all of downtown South Haven and just a short walk to the beach with no worries about parking !! This unit is fully equipped and has all the comforts of home&hellip;stove, refrigerator, microwave, portable dishwasher, washer/dryer,small appliances, air conditioning, and cable TV. Please&hellip;no pets and smoking is not allowed inside the apartment. What a fun vacation spot! The apartment had all the needs for day to day and gave a quant cottage feel. And the location made everything so easy. We walked to town for dinner, the farmers market, outdoor concert and the beach. Would love to go back again! We have stayed in many locations in So Ha over the years, and we will be staying here from now on! Great location, easy booking, and we slept 6 comfortably. Super cute inside! Thank you so much for a great Vacation place to stay! It was nice and spacious, good location. However there were ants in the kitchen, the coffee maker didn't work ( we bought a new one) no lights in the kitchen. The shower head you could pull out of the wall if you weren't careful. I had not seen your review. Still learning to navigate this site. You called me about the ants which was taken care of immediately. Wish you would have notified me about the coffee maker. There was no need for you to buy one. Unfortunately we don't test the coffee maker after each renter leaves. Notification by you is all that was needed for the broken one to be replaced. This place was in the center of town, so a good location and was clean. It was not well cared for and needs some TLC. We were quite disappointed. The paint in the living area was terrible with dry wall tape showing and lots of peeling. There was a dirty outdoor wicker set in the living room in need of paint and repair. The paper towel holder was a broken off yardstick. The shower faucet was not attached to the wall. The list goes on. I would not stay again! We do not have a condo type setting, we have a quaint cottage setting. What displeased you most people find charming and love this apartment. There is no paint peeling but you are correct that approximately one foot of dry wall tape needs repair. Your are also correct the shower head needs fixing although it has a temporary fix until the busy season is over. I will say it is interesting you would choose to complain but didn't bother to notify me you had bled all over the skirting to the bed, the bedspread and the carpet. You left the toilet unflushed with feces in it. I wouldn't have you as a renter again. You are the nastiest people that have ever stayed there. The apartment was very clean, comfortable and conveniently located. Blueberry picking is available at several locations. Our beautiful beaches and lake provide swimming, boating,fishing, water skiing, windsurfing. There are local canoe and kayak rentals as well as jet ski rentals. And for those of you with a less entergetic persuasion there is just walking the beach and laying in the sun. The local movie theatre provides 3 viewing screens with something for everyone. and hiking and in certain sections horseback riding. Tennis courts are available at our local high school. Nightly Rate: $100 - $170 Weekly Rate: $400 - $900 Monthly Rate: $800 - $800 May 15 thru Sept 15...$750 weekly or $150 per night for less than one week (excluding Harbor Fest, July 4, and Blueberry Festival) Harbor Fest rates...$900/wk ($150 nightly) July 4 celebration rates...$900/wk ($150 nightly) Blueberry Festival rates...$900/wk ($150 nightly) Off-season rates: Nightly...$100 Weekly...$400 For rentals other than full week, please call for availability. A 50% deposit is required at time of booking and the balance is due 30 days prior to arrival. Cancellation policy: if canceled before final balance is due, a $100 processing fee will be withheld, and the remainder, if any, will be refunded. If canceled within 30 days of arrival, full deposit will be forfeited. Additional charges: $50 cleaning fee, $200 security deposit (refundable within two weeks of departure), and all applicable taxes. Check in time is 4:00 on Saturday and check out time is 11:00 the following Saturday. Same time frame applies for partial weeks.